Comments play a key role in creating a good relationship with your audience and also in the growth of your community. 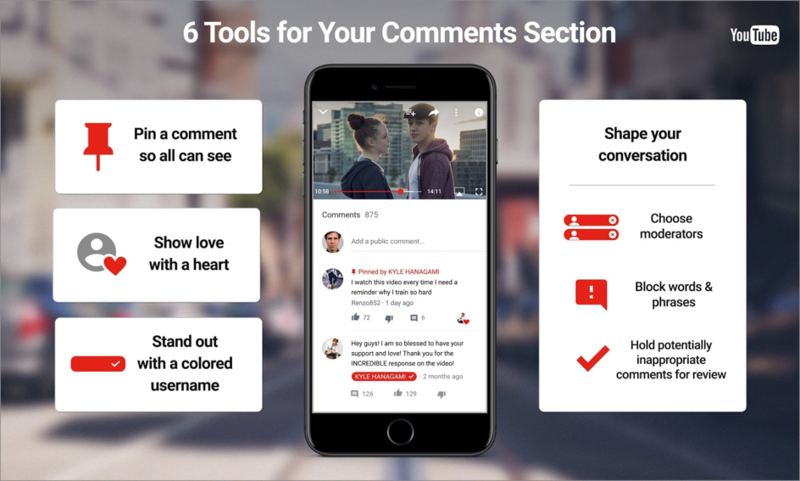 Since last year, YouTube has deployed new features that aim to help with the moderating of comments on your videos. Here’s how to use them to build loyalty with your fans. Pinned Comments: You can promote a specific comment by fixing it at the top of your feed. This allows you to highlight the commitment of your fans or share information with your audience. For example, as soon as you bring out a new song, a new clip or you have a new date, pin a comment to promote your new release at the top of your most important videos! Creators Hearts: This allows you to show a little love by adding a heart to your favourite comments. It is a new and simple way to recognize the best feedback from your community. Your Username: When you comment on your channel, your username appears below the text with a colour image around it so that your audience can easily say the comment comes from you. How to manage well your comments? Better manage your communication is also having the possibility to choose what you want to appear or not. A Better way to manage your communication is by moderating the comments that appear, this can be from negative feedback to spam but is important to keep a clean comments section as it is very influential. Choose moderators: You can now delegate moderation, giving people of your confidence the ability to remove public comments from your videos. Words and phrases “black listed”: You can have comments with certain words or phrases set aside to be examined and see your approval before being published. You will find more information in this article.